Ship Sticks CEO, Nick Coleman explains that, “The service has generated worldwide buzz from traveling golfers.” When learning that Ship Sticks was recognized again this year, Coleman stated: “This award further validates our everyday goal of increasing the number of rounds played per year.” He goes on to say, “There is no greater feeling than knowing we’ve relieved the stress and hassle that comes along with traveling, especially on an expensive golf trip.” Because of their continued dedication to providing customers with the quality service they expect, the company continues to advance. In addition to shipping golf clubs, Ship Sticks makes it easy to travel bag-free by offering a luggage shipping service. The company provides shipping to top travel destinations worldwide. Avid golfers are able to travel confidently to their bucket list courses knowing that their clubs and luggage are in good hands and being monitored by the dedicated tracking team at Ship Sticks, every step of the way. These added services offered by the company is how they are able to continuously be recognized as the "Best Golf Club Shipper" in the golf industry. 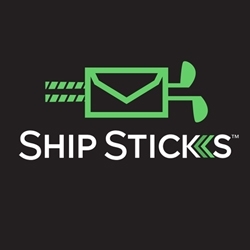 Ship Sticks provides a door-to-door shipping service designed to enhance the travel experience for golfers around the globe. With an easy to use website, customers can get a quote, schedule a shipment and track their package in real-time. The hassle-free service will pick up and deliver your golf clubs directly from your residence, business, country club or hotel and deliver them straight to your destination. All shipments come with complimentary insurance, a dedicated tracking team who ensure your golf clubs arrive safely and on-time. For more information, please visit www.ShipSticks.com.